MicroworksPC is a useless application that claims to be a collection of “browser enhancement tools”; however, our tests and research show otherwise. We have discovered that this software is simply a new adware application that displays annoying and space-consuming third-party advertisements and best deals with the label "ads by sponsor." As a matter of fact, this ad-supported program is not even that new, but only a new variant, or should we say, a clone of MintcastNetworks. You should know that adware programs like these can easily be exploited by cyber criminals to show you misleading commercials so that you click on them. This click can then cause you a number of system security issues if you get unlucky. We believe that this adware application should not be kept on your computer if you plan to keep your PC clean of infections. In other words, we suggest that you remove MicroworksPC ASAP and check your system for other potential threats because when you find this adware on board, there is likelihood that it will not be alone. You can find the official website of this useless program at microworkspc.com. The first thing you may notice about this site is that there is actually no download button and no other possibility either to download this software. However, you will find several and quite obvious buttons that claim to show you “Uninstall Instructions.” We find it slightly strange and suspicious that on a promotional page a product is not available, but, instead, there is more promotion regarding its removal. So the question is now: How come this adware has ended up on your computer? Although right now this malware infection may be dying down, we can still tell you how it may spread. Unfortunately, this application does not use official channels, but only questionable ones. This should be a good enough reason already to delete MicroworksPC right away. But let us go on into details. We have discovered that this adware can drop onto your computer when you click on malicious software updaters or you activate Trojan-droppers. You can encounter fake updaters when there is an adware application on board and this infection displays such a malicious pop-up ad for you while you are surfing the web. Or, you are visiting a shady gaming, dating, or file-sharing website and you click on an unreliable pop-up or banner ad. Therefore, it is logical that you can actually avoid such attacks if you do not visit suspicious websites and do not click on third-party ads. The bad news here is that it is quite possible that you download a whole package of malware threats instead of just this one adware program. This would mean multiple security threats, of course. Trojan-droppers may spread by spam e-mails as infectious attachments, such as image or video files, and sometimes text documents. But they can also be distributed via social networking sites, including Facebook and Twitter. You may find on your wall or among your feed a must-see video or image with most likely pornographic content. You should never click on these because that is just enough to drop this adware and a number of other malware infections onto your machine. As you can see, you need to be very careful what kinds of mails you open and which attachments you click on, not to mention other potentially malicious links you may be exposed to. All in all, no matter how this adware program entered your computer, you should run a full-system malware check after you delete MicroworksPC. This application promises you “browser enhancement tools,” whatever that means according to the dictionary of its creators, but, instead, you get a good old recipe for constant flow of annoying and potentially harmful third-party ads. These ads can cover a good portion of your screen, which is rather disruptive when you are scrolling through a products page in an online store, for example. However, instead of so-called best deals, you can only see promoted third-party ads disguised as great offers. Clicking on any ads displayed by this program may be a risky thing. You can never know who actually a third party is. What if cyber criminals hide behind one of these ads and they are looking for their next victim or prey? You may end up on unsafe websites, you may let more infections onto your PC, and you may well be scammed out of your money if you click on them. This adware can also gather information about you based on your browsing history, your search keywords, your IP address and many more. This package of information can be used to make a profile on you, which can be shared with potentially unreliable third parties. This is why it is not safe to click on ads that particularly look relevant to you. We recommend that you remove MicroworksPC as soon as possible, if you do not want more security threats on your PC. At least at the end we can provide you with some good news: You can easily uninstall MicroworksPC. 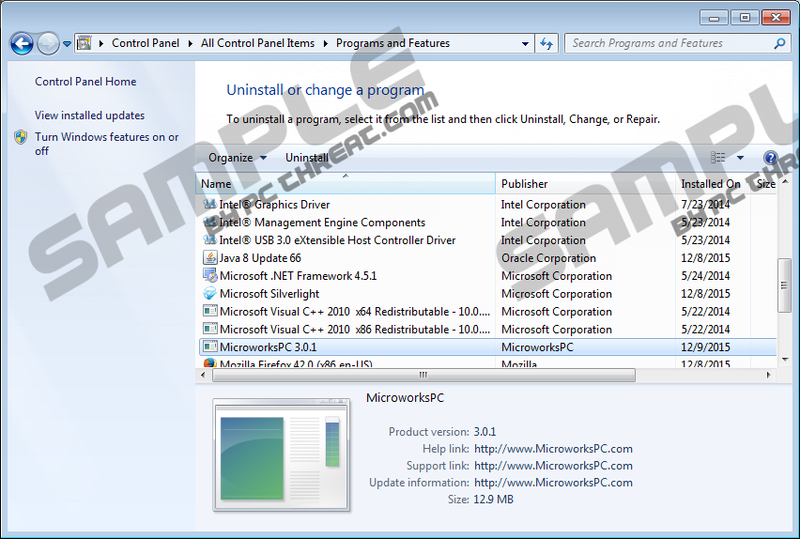 All you need to do is locate this uninstaller in the list of installed programs in Control Panel and execute it. Please use our guide below if you need assistance with this. It is possible that you have had enough of fighting these endless battles with malicious programs. We suggest that you protect your PC with a professional malware removal that can automatically detect and eliminate all kinds of threats. Your peace of mind could be one single click away. Tap Win+I and open Control Panel. Quick & tested solution for MicroworksPC removal.